On a few previous posts, I’ve showed some stages of preparing a woodblock. I’m now revisiting this subject as I’ve been asked to make a new block for EBBA (see my post from March of this year, “Proof of Purchase”) Hopefully, this will play a very small role in helping UCSB students experience creating and printing ballads on a hand press. Patricia Fumer suggested a few favourite images from their archives, and I selected a tavern print which can be seen here. The original is in the “Roxburghe Ballads”, part of the British Library’s collection and I reasoned it would be easy to go and see to get a feel for the size and the paper. Sadly, this turned out not to be so, as the books were too fragile to be viewed. 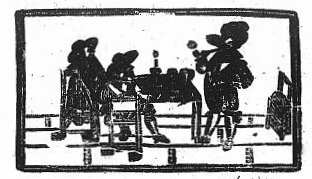 However, the curator of rare books was kind enough to measure the images on the ballad for me. 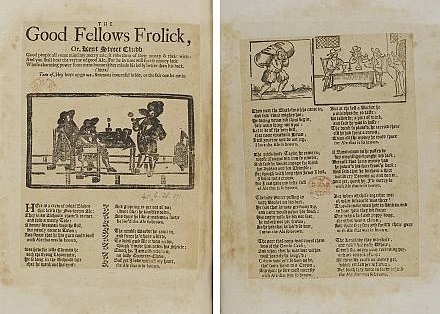 The image on this particular ballad, “The Good Fellows Frolick” is pretty poor print quality. But like many of its kind, this block had had a long career in the print trade. 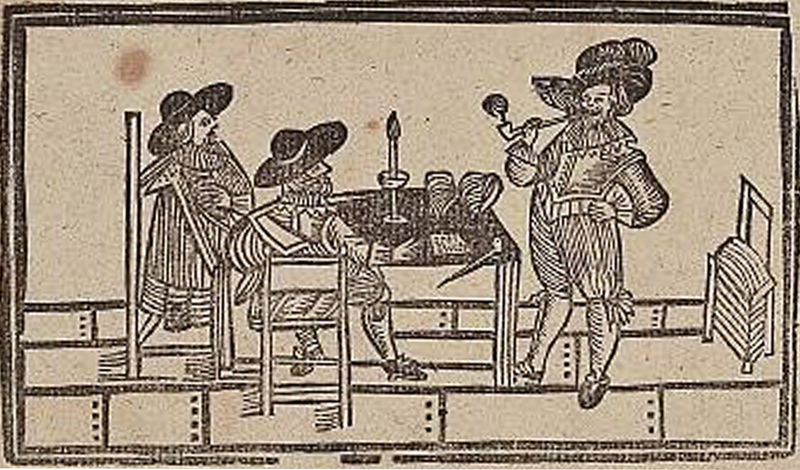 We can guess at its longevity, since this ballad is estimated to have been published in 1682, but the figures are wearing clothes more akin to the fashions of the 1630s. So it was easy to track down another appearance of the same image, this time in a ballad collected between 1663 and 1674, with a much better impression – see top. So, having found my image online, and succeeded in the improbably difficult task of getting it to print on paper actual size, the next task will be to prepare the pear wood – cut it to the right size and the all-important type high thickness. Part two to follow: transferring the picture onto the block. *Mechanick Exercises on the Whole Art of Printing, by Joseph Moxon, my edition a Dover Publications reissue edited by Herbert Davis and Harry Carter.